My name is Alex Rohde, and I got my tattoo done at the Clandestine Rabbit tattoo shop in Tarzana, Ca by an artist named “Nero”. I had always wanted to get a Zelda-related tattoo since i was a little kid, and started thinking about it seriously once I turned 18. I wanted it to be thematically appropriate, so the decision was made to have it done on my left hand. The problem was that I was working in IT, and even though my bosses then (and now) are totally awesome and didn’t care, I knew I wouldn’t want ink on my skin in a place I couldn’t hide easily. 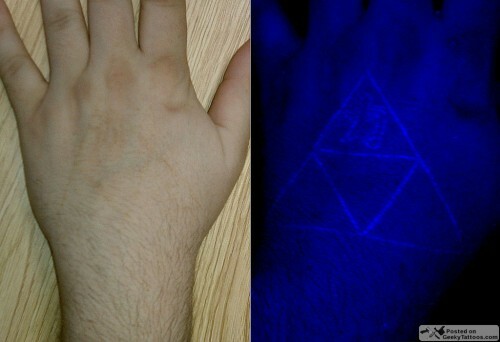 That brought up the idea of a UV tattoo, the point being that once it was all healed, it would be nigh invisible. When I had my design and money ready, I did my research, and ever place I visited in my area of Los Angeles said that Nero was the guy to see. I went in, set up an appointment, and got it done. It’s been just over 13 months since, and although I could have been more diligent with the vitamin E treatments, it’s almost gone. Under a blacklight, it’s awesome, far clearer than my pic suggests. The kanji at the top essentially translates to “power”, and represents Ganondorf, my favorite villain of any game series ever. Tagged with Clandestine Rabbit, hand, Nero, Triforce, Triforce Tuesday, ultraviolet, UV. UV Tattoo?! Mind == Blown, I thought they were something that only existed in ShadowRun. Damn, for the first time in my life I'm actually considering getting a tattoo, an UV Tardis or something would be so awesome. This is cool. I have been considering adding some UV ink to my Klingon tattoo, but I'm still a little nervous on any possible long term effects. But if I find it to be safe, it is most definitely something I want to do. I would add it to the "white" outline of the symbol. Anyone interested to see what I'm talking about, just do a search for Mike's Klingon tattoo here on this site.